“For nowadays the world is lit by lightning!”How I wish Tennessee Williams was from this era…perhaps Laura, in the Glass Menagerie, would have learned to find a world inside her kaleidoscope and menagerie, and learned to love it. Because that is exactly what glass-artist Uma Singh has done – after she created her own menagerie by using creation itself! For a young Uma Singh visits to Konark and other temples in Bhubaneswar were nothing short of magical. The overwhelming art that welcomed and surrounded her was what she carried back with her. The City of Joy, Calcutta also was equally influential in defining young Uma’s artistic inclinations and sensibilities from the very beginning. Exquisite and beautiful stained glass was present everywhere – the school church, the stately mansions that were so much a part of Calcutta – young Uma was enthralled. From here, began her fairytale obsession with the world of coloured glass, which turned into a “serious pursuit”, as Uma puts it. Her holidays and travels abroad, especially to Europe added more fuel to the burgeoning fire within her. ord Krishna sits in a pensive mood. 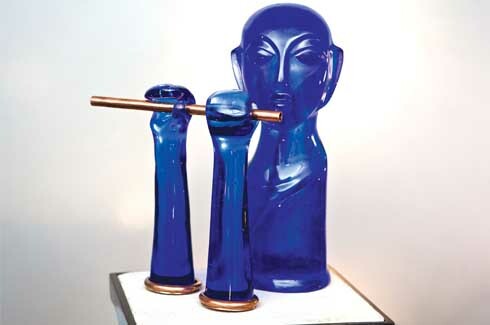 The visual juxtaposition of the blue glass and the brass, adds a dimension of elegance and identity. 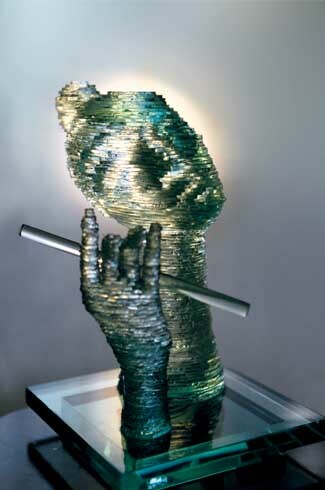 Self-taught, Uma has been working with glass for over three decades now. And it hasn’t been an easy journey. During her travels to the US, she would visit various sites, museums and glasshouses to collect information about the different kinds of glass. She turned to libraries, and the information and knowledge she gathered from the various books really propelled her in the direction of glass-making. However, upon returning to India, it seemed as though nothing was going her way. “Nobody knew how stained glass was made,” she says. Upon visiting demolition sites she learned that pieces of coloured glass are assembled in U and H-shaped lead came cross sections. The glass available here was exorbitantly priced, so Uma decided to go about it another way and asked around for help. 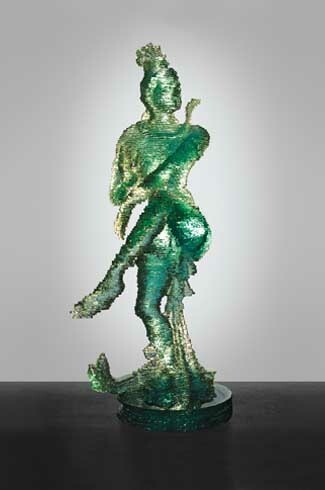 Natraj – the cosmic dancer, whose dance destroyed a weary universe so that Brahma could start the process of creation, created using the cold-carving technique. Luck favoured her and help came in the form of an old gentleman who showed her his glass collection that he had preserved from 1954 to the latter half of 1983, which was when Uma met him. “He had a treasure trove of glass pieces in his garage, and I bought the entire lot from him for a princely sum of Rs. 6000,” she reminisces fondly. From the glass procured, Uma created her first work of stained glass art. “I have always been fascinated with our Indian gods and goddesses. And I always wanted to create something which would reflect what I had seen as a child in the various temples I had visited,” she adds. 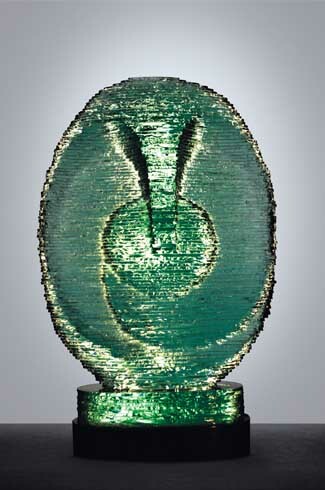 Uma displayed her first original work at the 1983 annual exhibition held by Business India and Inside Outside magazines. In 1988, Uma held her first solo-exhibition at the Oberoi Hotel, Mumbai, which as she says, “was a runaway success.” And since then there has been literally no looking back! This simple representation of the Elephant God, Ganesha, comes very close to the statues and sculptures of the deity we see in our temples. 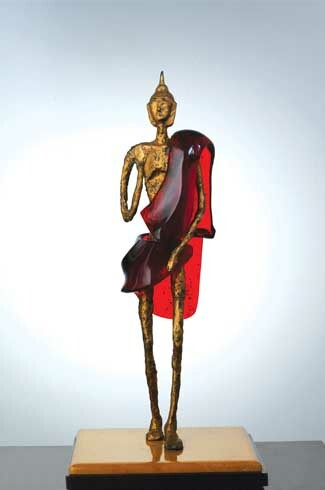 By early 2000s, Uma was a well-established glass-artist in India. But as is the case with an artist and her art, the need to learn more and be more became of paramount importance. So the next stop for Uma was, glass-sculpting. She got herself a tutor to help her with clay-modeling, and also joined the Academy of Fine Arts, Kolkata, where she learned the art of sketching and fine-tuned her clay-making. Lord Krishna, as though in a trance, tilts his head back – perhaps enjoying the chirping sounds of the birds and the low gushes of babbling brooks. Uma’s favourite piece and ours too! This bronze Buddha with a red drape is exquisitely carved and rendered with all its (im)perfections. 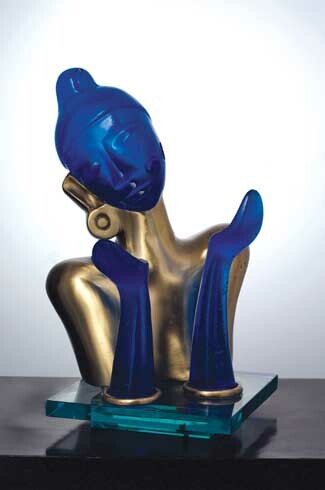 The Bronze Buddha and Uma’s other beautiful works will be on display at – “The Gods in Glass”, Uma’s forthcoming exhibition which is to be held at the Visual Arts Gallery, India Habitat Centre, in New Delhi; from October 25, 2013 to October 31, 2013; with a special preview on October 24, 2013.